This bread is slightly sweet, chewy, nutty — and delightfully dense. 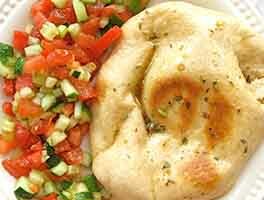 The method for making it is similar to no-knead, with time doing most of the dough development. A bit of hands-on "folding over" helps the process along. 12 hrs 10 mins. to 20 hrs 40 mins. 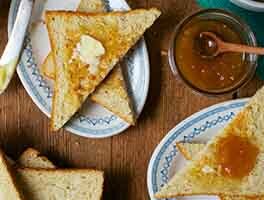 Place the warm water in a large bowl with the fruit and malted wheat flakes. Let sit for 15 minutes. 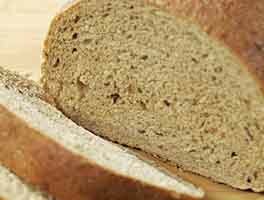 Whisk together the flours, Whole Grain Bread Improver or vital wheat gluten, salt, and yeast. Pour into the bowl with the water/fruit; stir to blend. Use your hands to fold the dough over in the bowl until the flour is incorporated. Add the nuts, and continue to knead the dough for a minute or two, until the nuts are evenly distributed; it will still be slightly sticky. Let the dough rest at room temperature, covered, for 3 hours. Turn the dough over a few times, cover, and refrigerate for at least 8 hours, or overnight. Shape the dough into a long loaf or ball, and place it in a lightly greased, lidded 14" to 15" long stoneware baker, or lidded 4 1/2-quart baking crock. Cover with plastic or a damp cloth and let rise at room temperature for about 3 to 4 hours, until it's noticeably puffy; it's not a high-riser. Slash the loaf a few times on the diagonal. Place the lid on the pan, and put the pan in a cold oven. Set the oven temperature to 400°F. Bake the bread for 50 minutes, then remove the lid and bake for another 10 minutes, until it's deep brown and an instant-read thermometer inserted into the center registers about 205°F. Remove the bread from the oven, transfer it to a rack, and cool before slicing. I omitted the dried fruit and nuts, so had to add some extra flour I baked it in a long Romertopf, which worked perfectly - baking time was exactly as stated. The bread had good flavor and a pleasant chew. It stayed fresh all week long and was great for sandwiches and toast. To be honest, it took me several months to gather together my courage and patience to finally make this bread. From the moment I discovered the recipe, I knew this is what I want to make. I ordered the malted wheat flakes and had them for a few months in my pantry. Every time I planned to make a bread, I was reading this recipe, but the long process was kind of intimidating. Well, not anymore. Actually, the hands-on time is relatively small as the bread magic happens behind the scenes. Yes, you have to be patient and go through the waiting process to receive a reward. I followed the recipe, except the grapeseed flour (I used teff flour, as this is what I had from the non-gluten flours). This is just unbelievable and educational experience to watch how the dough and aroma changes after each waiting stage. My second waiting (refrigerator stage) was longer than suggested, as I had to go to work, leaving my dough in the fridge for almost 20 hours. I used Cloche Bread Baker (sold on this website) to bake my bread. I still cannot believe I made it in my kitchen. It looks beautiful, and the texture, density, aroma, crunchy crust, and taste are a pure magic! Thank you KAF team, as you inspire, lead, and teach me. You share this magic and your baking tips, and I am truly grateful. I have made this bread twice, and have an incipient loaf in the fridge right now. It is just delicious -- flavorful, textural, hearty and healthy. I did not have any bread flour so I used an extra half to full tablespoon vital wheat gluten. I used the Emile Henry covered dutch oven to bake it in and it took about an extra ten minutes after I took the top off. I will make this bread again and again. Wow! Hearty, healthy, & delicious! Excellent! Especially in light of the fact I didn't have any flour enhancer. I wanted to use up some leftover ingredients in my pantry (and not have to buy new) so I decided to try this. So glad I did. Delicious, not sweet, and hearty. I think this might be a 5 star recipe after some baking guidance, so here's my question: I baked this in a ceramic covered dish (Emile Henry flame-ware). When I removed the lid as directed by the recipe, the bread still took about another hour to come to the correct internal temp. That's a lot longer than the ten minutes the recipe suggests. The bread also came out slightly blackened on top and with such a hard crust that I had to store it overnight in a plastic bag to be able to cut it, and it was still hard to cut. I'm guessing that the ceramic (or my oven, I suppose) comes up to baking temp inside the pot more slowly than a basic KF covered baker. If so, this would suggest that I leave the lid on for longer. Do you think that would help? Any idea how much longer? Or is there an internal temp for the bread at which the lid should be removed? Thanks for any help. 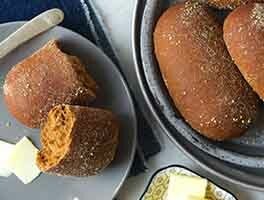 The flavor and texture of the bread are superb, so I would love to get the crust dialed in. The recipe worked great. It is easy to make and the taste is phenomenal. I did not have time to take the bread out of the fridge after 8 hours so I left it for 20 hours, which was no problem. Love it! 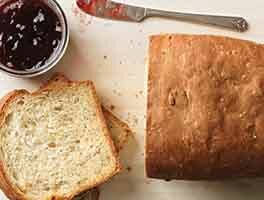 This is a robust bread and seems very flexible...I used 1/4 cup oatmeal flakes instead of the grapeseed flour, not having any of that. I also had a time hang-up and the first rising ended up being......14 hours, though in a cool house. I just plowed ahead hoping for the best, and it turned out great with nice texture. Tasty, chewy, dense, flavorful, good for you, excellent toasted - what more can I say?! I did not have the grapeseed flour, but will try it with that some time in the future. 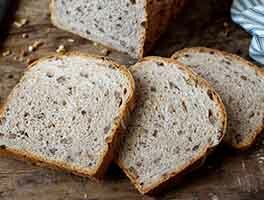 I used vital wheat gluten, instead of the whole grain improver as that is what I had on hand.. I will definitely make this again as it is so easy to prepare -- and it tastes great!